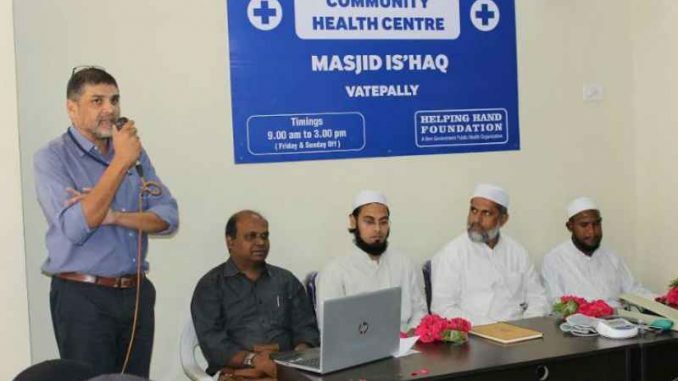 Hyderabad: A Hyderabad mosque has opened a new clinic in its facility to help the poor from all religious backgrounds get access to medical care, Times of India reported. “The community health center at the mosque will serve as a referral link to about 30 state-run hospitals providing primary to tertiary health care,” said Mujtaba Hasan Askari, managing trustee of the Helping Hand Foundation (HHF). Located at NS Kunta, Masjid-e-Ishaq will have a full-fledged primary health center managed by a team of paramedics and doctors. The initiative of the masjid committee and the Helping Hand Foundation will ensure that about roughly 1.5 lakh population in the area will get access to primary health care. The center has come up on 1,000 square feet area on the ground floor of the Masjid-e-Ishaq. Meanwhile, the remaining two upper floors of the mosque will be used for offering prayers and other religious activity. “The primary health center will provide referral link to State hospitals. Likewise, basic primary and home care including free diagnostics, vitals, performing CPR, Wound Management, Maternal Care and Physiotherapy too will be offered,” Askari added. Maulana Faiq Khan, the Khatib of the Majid Ishaq said, “We were keen to set up the health center from our masjid that will be a source of Allah’s mercy for hundreds of poor people in the slums and we are glad that Allah’s house is being used for a good cause regardless of religion and faith,” he said. Faiq Khan added that the mosque would also hold health education programs for pregnant women, ensure 100% vaccination compliance for children in the area, and distribute nutrition kits to malnourished pregnant women. It will also conduct periodic screening for both lifestyle diseases like diabetes, hypertension, cancer, kidney diseases, and infectious diseases like dengue and tuberculosis. The center will help people living in the areas of Vatapally, Chasma, Mustafanagar, Pahadi Guntal Shah Baba, Tekri Biryani Shah,Teegal Kunta, Jahanuma, Tadbun and Fatima Nagar. “We plan to set up more such centers after getting space in various mosques. There are several masjids which are spacious and willing to provide space for such a facility,” Askari told. He added that the initiative would help many patients from slums who cannot afford to travel to government hospitals. “We aim to provide free transport to patients on a daily basis and guide them to the right hospital depending upon their ailments. If the need arises, we will take help of our donors for the treatment of people in private hospitals,” he added.